It’s the season for protective styling. Many naturalistas are looking for a good protective style to tuck those ends away during the colder months. Not familiar with protective styling? A protective style is a hairstyle that protects your hair. Especially focusing on the ends, which is the oldest part of your hair. 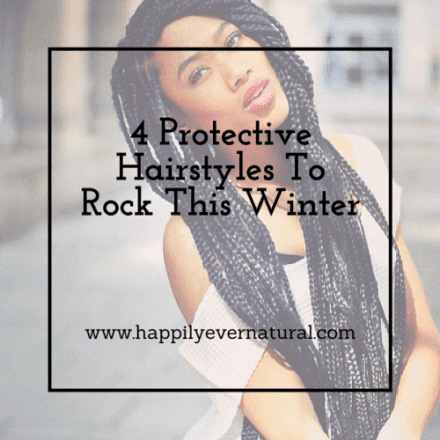 You want to protect your hair from the elements, from rubbing against your clothes, from drying out quickly, and to help protect your hair against breakage. Frequent washing and styling of your hair can also lead to damage so give your hair a much needed break with a protective style. When having a protective style, you want to remember as with any style to be careful not to leave the style in too long. You definitely don’t want your hair to get matted, it’s the worst! Also make sure to keep your hair moisturized while in your protective style. I like to make my own mixture of water and my favorite oil to spritz on my hair while in a protective style. Also, make sure that you are wearing a satin bonnet or scarf at night to protect your hair as well. Here are a few super-cute protective hairstyles to try out if your feeling frisky! This is a super cute style if you want to experience locs but don’t want to actually loc your hair. This is my most favorite go to protective hairstyle of all time! You have to remember not to mess with your hair much. Brush the edges and wear a scarf or bonnet at night to keep your hair in tact. This style is also a super cute style that’s hot right now. I love this look. This classic protective hair style will never get old. Happy Protective Styling! What’s your favorite style, or one that you would like to try? Comment below!